Karen Ranzi is offering up one copy of her book Creating Healthy Children, Through Attachment Parenting and Raw Foods, a value of $25. 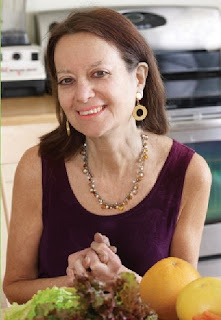 Karen Ranzi is an author, lecturer and raw food consultant. She has appeared on TV and radio, talking on topics such as vegetarian and raw food parenting and attachment parenting. In addition to her work in nutrition, Karen has been a speech therapist working with children of all ages for over 30 years, specializing with autistic children for the past 10 years, and she holds a master’s degree in speech pathology from New York University. I was super excited to receive my copy of Creating Healthy Children as it encompasses two of my passions, raw food and attachment parenting. I realised long ago that it is pointless perfecting or researching only one facet of bringing up healthy and emotionally stable children. Both physical and emotional health are of great importance, equally. In my opinion, you could be the most devoted and attached parent in the world, but if you do not address your child’s diet and give him the nutrition that he requires, your efforts will be fruitless. I have seen this with my own son. Jesse radiates warmth and happiness and is a secure and confident little person, who has a clear head and is not bogged down by typical childhood complaints such as earache, runny noses or tummy trouble. This freedom from ‘normal’ complaints has ensured that his development is never hampered and he is always full of joy. 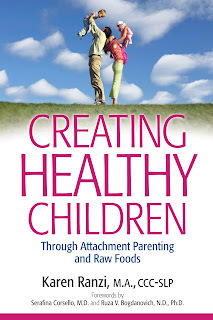 This book addresses both aspects, your child’s physical health by providing optimal nutrition from conception, and also your child’s emotional health through the gentle parenting philosophy of attachment parenting. Most readers of Natural Parents Network are familiar with attachment parenting, and most have adopted attachment parenting philosophies such as co-sleeping and babywearing already — a raw food diet, however, is still foreign to most. It will be difficult to argue with Karen’s research and recommendations, even for the most sceptical of readers. This book is chock full of expert opinions. I have often written on African Babies Don’t Cry about my son’s impeccably healthy start to solid foods with only raw fruit. This gradual and easy start set his digestive system up for success. We have slowly started introducing more and more foods, starting with the fruit, then raw vegetables, seeds and a few nuts, and finally cooked vegetables. I have not been able to commit to a 100% raw diet myself yet, and so find it difficult to feed Jesse only raw; however, this book is full of inspiration as well as the facts as to why I should make this transition soon. — T. Colin Campbell, Ph.D., Jacob Gould Schurman Professor Emeritus of Nutritional Biochemistry, Cornell University, Ithaca, NY; Co-author of The China Study. This book is a wealth of information on every topic a parent should read up on before having children: from pregnancy, homebirth and breastfeeding to the vitamin B12 controversy. Karen goes into much detail with every chapter, quoting many scientific papers and respected authors, giving you, the parent, all the information, and allowing you to decide which is best for your child. A few readers may find this book a bit too long (over 400 pages), but I thoroughly enjoyed how in-depth and informative it was. She starts at the beginning, before conception, addressing the mother’s and father’s diets. Karen advises a detox before planning a pregnancy, and although not all of us have the foresight or opportunity to plan (myself included here), I can totally see the benefits of doing so. Karen broaches the topic of morning sickness as a sign of the body getting rid of toxins. She coaches the reader on how to have a healthy pregnancy, free from any complaints; after all our bodies were designed to carry babies — it’s a shame that so many of us suffer so much whilst doing so. Many mainstream readers, although they may be practising attachment parenting, may balk at the thought of a raw food diet. Karen clearly outlines the benefits of a diet high in raw fruits and plant matter, but even better, Creating Healthy Children also has a whole section of success stories from a bunch of raw foodists. I loved this section. It is so inspiring to read the drastic changes people have made to heal illnesses and overcome challenges to become so successfully healthy. Karen also writes from a place of first-hand experience — she cured herself of gynaecological problems and freed her son from his constant asthma, ear infections and allergies. Karen also broaches the more testy subjects of circumcision and vaccinations. She tells her admirable story as a Jewish mother who chose to keep her son intact and gives the ins and outs on vaccinations. I recommend this book for all parents or parents-to-be who are striving to raise healthy, happy and stable children. I thoroughly enjoyed it myself, and consider it a valuable addition to any library, as so many parents are in the dark when it comes to the right nutrition for their children. For your own chance to win a copy of Creating Healthy Children, by Karen Ranzi, enter by leaving a comment and using our Rafflecopter system below. MANDATORY ENTRY: Visit Karen’s website, Super Healthy Children and tell us which one of the chapters of the book you are most wanting to read! You must enter your name and email address in the Rafflecopter entry system for your entry to count, after leaving a comment on this blog post. Contest closes June 9 at 11:59 p.m. Eastern Time. Christine is a teacher turned work-at-home mom to her beautiful son, Jesse. She lives in South Africa and is passionate about bringing up her son as naturally as possible. 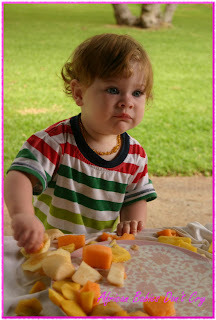 Christine blogs at African Babies Don’t Cry, where she often writes about natural nutrition and toddler health. As a childbirth educator I’m most looking forward to reading her information in nutrition for pregnancy and childbirth. I’d love to read the book to have more information for my childbirth Ed students. I look forward tonreading the chapter on how to encourage older children to healthier eating and lifestyle choices! Id like to read feeding your baby raw foods, the sun and you and the vaccines and your health and homeschooling chapters. The whole book really! I think I’d like to read every chapter!! But Chapter 33: Dental Health and Raw Foods is definitely one I’d love to explore. maybe…Chapter 2: The Health of Mother and Father Prior to Conception. I could always use advice and resources relating to our kids health. I appreciate any info that may be useful. I am very curious to read how a raw food lifestyle is optimal raising healthy children (and what this lifestyle means). It sounds like it includes a lot of really great information! The whole book looks really interesting, but I think Chapter 12 about feeding baby raw foods looks particularly interesting. I am interested in reading this book because I would like to learn more about a raw food diet, especially for my son. I’m really interessted to read the very first chapter about her story, because I think it’s always fascinating to read what people change to live a better life and why they see the need to do this. I would love to read this book as my husband and I have converted to a clean diet in which I have been trying to incorporate a larger amount of raw foods. I would like to have a better understanding of it with regards to feeding our 8 month old daughter as I would like to be able to give her the best start in life. Dental Health and Raw Foods (Chapter 33).